You want to record video of what happens on your screen in a simple click? You want to be able to record any selected region of your screen? You want to record them as QuickTime movies to replay them with QuickTime Player on Mac? Single Window, Fixed Rect and Full Screen recording. Capture with customizable size, position and frame. 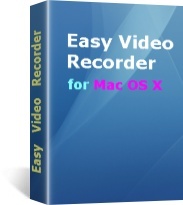 Easy Screen to Video Recorder for Mac is a great screen capture and recording tool for Mac which allows you to create screencasts (recordings of your Mac OS X desktop) that can be saved as Quicktime (MOV) files. Very easy to use Screen to Video Recorder software for screen capture and video recording purpose including video, audio and cursor options. It supports recording video, audio, and mouse cursor synchronously or separately. You can use Easy Video Recorder for Mac to record Screen, Camera, DV, DVD or iTunes DRM protection video into MOV file. Or export captured video to many other formats including iDVD, QuickTime, DV, MPEG-4, and more. With this software, You can creating video demos, software training videos, application demos, and make slide-show training documents with sound and text. You may change the options for recording, add text to video, record video with audio, choose to record mouse cursor or not, blink the area border when recording, and so on. Easy Video Recorder for Mac is now fully compatible with Mac OS X 10.7 (also known as Lion). Record from Screen Area into QuickTime Movie Video. Flexible and intuitive selection of a capture area. Realtime Video creation. No processing required! Supports recording video, audio, and mouse cursor synchronously or separately. Record Drm protection Video (M4V) to MOV, Say goodbye to problems with copy protection! Record with date and time. Record actual cursor or custom cursor. Edit your movie video after capturing. Record from your webcam, screen or video input device. Add your own text to video. Support add a highlight area around the cursor during screen recording. Create demo videos to demonstrate how to use Your software. Record web cams from AIM, ICQ, MSN Messenger, Yahoo Messenger and so on. Record DVD, VCD, MPEG, MP4, or other video media. Share your screen with a remote computer through video chat software. Copyright © 1998-2012 Share2.com All Rights Reserved.